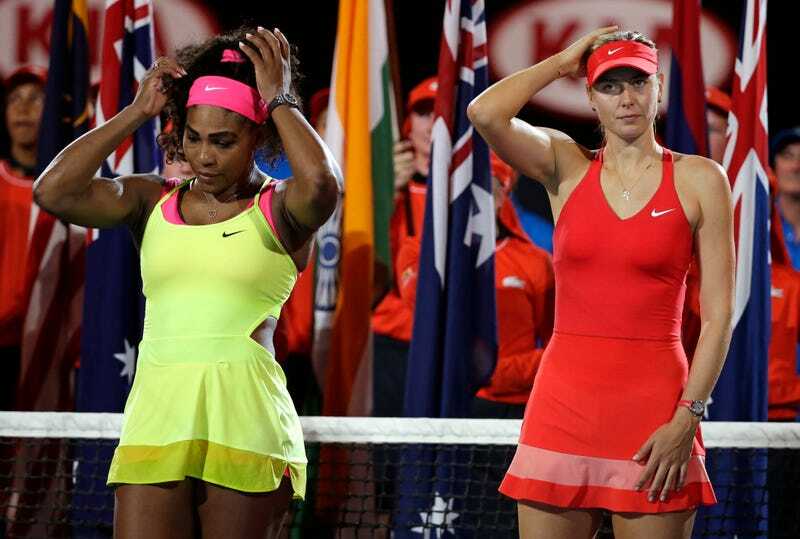 Serena Williams and Maria Sharapova wait for the trophy presentation after the women’s singles final at the Australian Open tennis championship in Melbourne on Jan. 31, 2015. The upcoming match between Serena Williams and her archnemesis Maria Sharapova is going to be as good as Apollo Creed vs. Rocky Balboa, Bird vs. Magic, the Rancho Carne Toros vs. the East Compton Clovers. Do you see any theme here? Good, me neither. Miss Serena, fresh off attending the royal wedding, threw just a wee bit of shade against Russian Mary during a news conference after both won Saturday during the French Open, positioning them for a Monday face-off for a quarterfinal spot. According to the Associated Press, Williams called Sharapova’s 2017 autobiography, Unstoppable: My Life So Far, “hearsay” and twice brought up the Russian’s 15-month doping ban. Honestly, there is no real rivalry between the two, since Williams, 36, has bested Sharapova, 31, in 19 of the 21 times they have competed, including 18 in a row. The last time Sharapova beat Williams was 14 years ago. But let’s play along anyway. The last time the two women met up was in the 2016 Australian Open quarterfinals, Sharapova’s final appearance before her 15-month drug suspension for testing positive for meldonium. Williams, of course, has returned to tennis after more than a year after giving birth to her daughter, Alexis Olympia.